Last week, new research was published in Science that examined the relationship between seismic activity and wastewater disposal wells. We’ve covered this issue before, so suffice it to say that this is not “news” per se, but there were some critical details worth highlighting. The researchers discovered that earthquakes in different parts of the world can actually trigger seismic activity near injection wells – activity that, according to the studies, was going to occur anyway, but the geologic vibrations from the large quakes accelerated the process. Another key finding is that many of the seismic events near disposal wells are preceded by significantly smaller seismic events, which can serve as a geological warning system of sorts. These are important findings, for reasons that should be obvious: Only a handful of injection wells are actually associated with felt seismic events, meaning these are incredibly rare. The EPA, which regulates wastewater disposal under its Underground Injection Control (UIC) program, says injection wells are a “safe and inexpensive option” for disposing of industrial waste. But if we have data that will facilitate even better management of risk – i.e. being able to adjust flow rates before a bigger seismic event occurs – then that’s good news. To be clear, there is still dispute within the scientific community about whether this is correlation or causation. State geologists in Oklahoma and Colorado, for example, have raised criticism over such connections in the past. But this latest research is still useful in understanding how we can even further reduce the risk of what’s already considered a rare event. “[Study author] Van der Elst has clarified, saying that it is not that the larger quakes abroad caused the smaller quakes at injection sites, rather the larger quakes sent smaller ripples that the researchers detected and took as a warning sign that these areas, near injection well sites, were under stress and vulnerable to quakes. He says the larger Oklahoma earthquake and the Chilean disaster were not related and that the Oklahoma quake would have happened regardless. It is also worth noting that none of the study sites in this most recent report were receiving wastewater from fracking operations. (But previous studies have looked at such sites.) 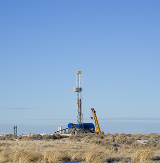 “It has implications for fracking,” Elst said. “If you dispose of fracking fluids on the timescale we studied [about a decade], you’d have to take that into account. Now, as van der Elst points out, the study does still have a role to play in understanding (and better managing) risks from shale development, especially how to dispose of wastewater after hydraulic fracturing. Companies are increasingly moving toward recycling and reuse as the option of choice (in addition to flat out using less water in the first place), but any research that can inform better strategies to reduce the likelihood of incidents – even if small and rare – should be welcomed. These were not producing wells where hydraulic fracturing is used. You’ve no doubt seen plenty of stories that claimed the research “linked” fracking to earthquakes, or that earthquakes halfway around the world could cause earthquakes at “fracking sites.” MSN even alleged that hydraulic fracturing itself might cause bigger< earthquakes than we thought — a claim that is stunningly devoid of any supporting evidence in any of the research reported on. For some, this might seem like a small but insignificant detail, but it’s not. Hydraulic fracturing and wastewater injection are processes governed by different regulations, and often times the injection well receiving wastewater is operated by an entirely different company than the one who owns the producing well from which the waste originated. Conflating these two processes, whether deliberately or accidentally, only moves us further away from a responsible dialogue about the risks and benefits of development, and how we can continue to improve operations as we move forward. Put differently, if we banned hydraulic fracturing tomorrow (a terrible idea, by the way), there would still be issues and risks to manage with respect to disposal wells. The research released last week would still be relevant, and the same complicated geological connections would still need to be studied further. This is why, in addition to basic accuracy, it’s important to explain the difference between a hydraulic fracturing site and a disposal site – something too many of our friends in the media simply chose not to do. You don't need big data and machine learning to reap benefits from data analytics. Improvements in risk management and other areas are possible using a well designed data analytics platform with traditional data warehouse technologies and..
Pay-for-performance places the performance risk squarely in the hands of the parties who are in the best position to measure and control it--as long as they have the right tools. With two elections behind us and uncertainty ahead over Brexit bringing the threat of yet another election, there is naturally a vacuum in terms of what form energy policy will take until we know what Brexit will mean.